A major shake-up is planned for the influential body that represents offshore oil companies, BBC Scotland has learned. The UK Offshore Operators Association is to change its name to Oil and Gas UK. It will also open its doors to the whole oil and gas industry. The body had previously only represented major operators such a BP and Shell, particularly when dealing with the government and the media. 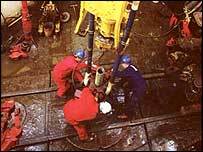 The UKOOA has been in existence since 1973, effectively since the start of oil and gas production in the North Sea. It will now become a wider trade association encompassing not just operators but also contractors, explorers and producers. Industry representatives will meet next week to finalise the plans.